What was Syria troubleshooter Lakhdar Brahimi cooking with senior U.S. and Russian officials in Geneva yesterday? Apparently fish – and the editor-in-chief of the leading Saudi daily Asharq Alawsat doesn’t like the unpleasant odor. Tariq Alhomayed suspects the three sides are working on a “distorted Yemen template” for the endgame in Syria that would keep President Bashar al-Assad in place until 2014. Brahimi said in a statement the meeting with Russian Deputy Foreign Minister Mikhail Bogdanov and U.S. Deputy Secretary of State William Burns was “constructive and held in a spirit of cooperation. “It explored avenues to move forward a peaceful process and mobilize greater international action in favor of a political solution to the Syrian crisis. 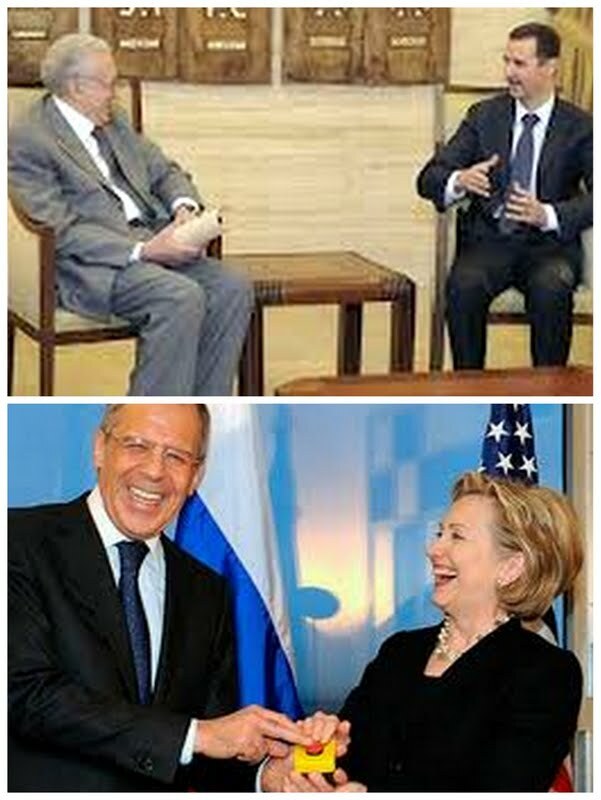 Sunday's meeting followed talks held last week in Dublin between Brahimi, U.S. Secretary of State Hillary Clinton and Russian Foreign Minister Sergey Lavrov at which the three officials agreed on the urgent need to initiate a political process to end the conflict in Syria. Participants at yesterday's meeting agreed that a political solution would be based on the core elements of the communiqué issued by the Action Group that met in Geneva on June 30. The Action Group is made up of the UN and Arab League secretaries-general; the foreign ministers of the five permanent members of the Security Council and of Turkey, Qatar, Iraq and Kuwait; and the European Union’s high representative for foreign affairs and security policy. Arab League Secretary-General Nabil Elaraby promises the Syria crisis is drawing to an end. The Qataris in turn are optimistic about an American-Russian rapprochement regarding Syria following the Geneva meeting. Sources tell me a Russian proposal is on the table whereby a transitional government is set up. Assad would have no powers over it and it would exclude anyone from his regime whose hands are stained with Syrian blood. A prominent member of the opposition would head such a transitional government. Accordingly, Assad would stay put in Damascus until 2014. He would not run in the 2014 presidential elections. He would simply call it a day and go home. That’s the scenario I heard. Of course, the Russians keep reiterating their stance on Syria. So my question is: If the Russians are not changing their position, insisting they are not holding talks on the fate of embattled Assad, why are the Americans and Brahimi meeting with them? Why are the Qataris and Elaraby optimistic? Elaraby says he hopes the U.S. and Russia can reconcile their views over Syria in order to prepare a resolution for the UN Security Council, which “will send a clear message to the (Assad) regime that it is no longer protected.” He also says the Syrian opposition could be a substitute for the regime in due time. So what justifies the optimism and the statements if the Russian position remains unchanged? In light of the aforesaid, there’s obviously an attempt to apply in Syria today the Gulf template used in Yemen. But the template has been distorted, presumably to preempt Assad’s recourse to chemical weapons. Obviously, it is a waste of time if in fact Brahimi and the American and Russian officials are considering a transitional government that keeps Assad at the helm until 2014. That would also be an effort to absolve Assad of all the crimes he committed, instead of showing him the door. Syrians would find it adequate if Assad’s exit to this or that safe haven were synchronized with the kickoff of the transition. But waiting until 2014 means bailing out Assad and recognizing him as president despite the death toll on his watch. Such a solution is surely unenforceable. A solution that sees Assad stepping down and staying in Syria – à la Abdullah Saleh, who stayed in Yemen after standing down as president – is also totally unacceptable. With the Free Syrian Army now positioned at the doorsteps of Damascus, and Assad’s regime on its knees, it is difficult to fathom a solution to the Syria crisis that does not see Assad hitting the road – not in one or two years, but now.